There’s a reason spinach-artichoke dip has been a restaurant menu staple for decades — it’s just so good. 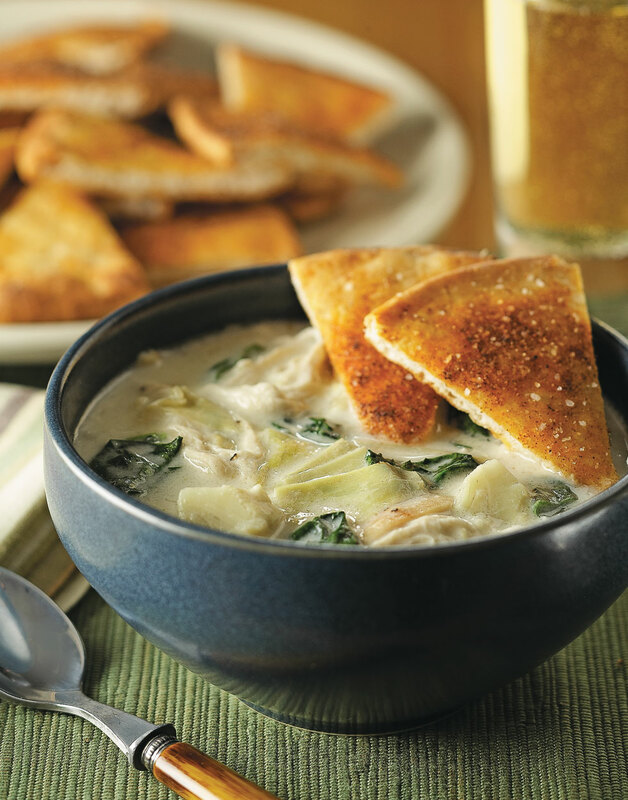 In this recipe for creamy, cheesy Spinach-Artichoke Soup it makes the leap from a popular appetizer to an impressive entrée soup, in just 20 minutes. Sauté leeks and garlic in oil in a large pot over medium-high heat until leeks are soft, about 2 minutes. Add chicken and artichokes; sauté 2 minutes, then stir in flour and cook for 1 minute. Deglaze pot with wine, scraping up any brown bits, and simmer until nearly evaporated. Stir in broth, milk, and cream; bring to a boil. Reduce heat to low, add the spinach and Parmesan, and stir until spinach wilts; season soup with salt and pepper. Because the heat from the soup wilts the spinach so quickly, add it just before serving.